Most diners and bar crawlers of twenty.one tables+terrace probably will not know why it is called twenty one. Just like its sister kitchen and bar in Changkat Bukit Bintang, this place was named after a series of coincidences. The length of the kitchen and bar in Bukit Bintang measures 21m, the phone number of the restaurant ends with 2,1 while the street address at which the first bar and kitchen is located is 20-1. Also, there are 21 steps to the second floor of the restaurant in Changkat. Twenty.one tables+terrace, as it is aptly named, is a famous spot for those turning 21. Dr.Bar Sdn Bhd public relations and marketing manager Janet Lam said many youngsters turning 21 celebrated their birthdays at their restaurant in Bangsar Shopping Centre. The newly-renovated kitchen and bar in Bangsar is now furnished with comfortable seating and new glass panels separating the dining area from the bar. Located on the third floor of the mall, patrons get a panoramic view of Bangsar and the Petronas Twin Towers while savouring the new selections on the lunch menu. The lunch set, which has been running since March, is an extension of the old lunch set with added dishes to please the palate. A selection of European and Asian fusion meals have been added to the menu, along with other European and Asian delights. Lam said they decided to retain local food in their set lunch as some diners enjoyed indulging in good old-fashioned Malaysian meals such as curry mee, beef rendang and nasi kerabu. There are a few must-tries on the lunch menu. One of which is the Prawn Risotto. Cooked with basil, tomato sauce and red curry sauce, this meal is good for those who want a rice-based meal. 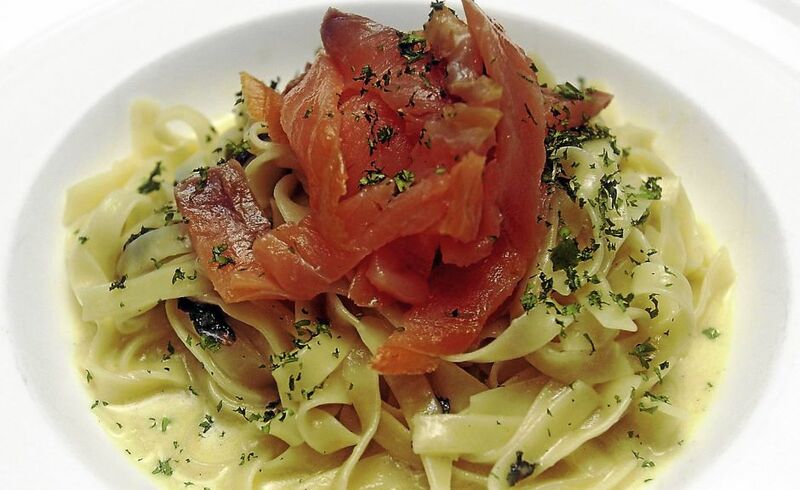 The Creamy Fettuccine with Smoked Salmon and Spinach is perfect for those who are often repulsed by having too much pasta. Lam, who admitted that she also felt that way about having too much pasta, said somehow she enjoyed this dish. The Breaded SS2 Chicken Sandwich on the menu has an interesting story of how it came to be. An outing to the night market in SS2 introduced the team at Dr.Bar Sdn Bhd to the concept of serving chicken in a wrap. They loved the meal so much that they came up with a dish made up of chicken in pita bread with jalapeno sauce and sweet potato chips. Once you have tried the main dishes, savour the tangy goodness of the lemon tart with whipped cream. Lunch-goers will be surprised at the price and portion offered. ?Our meals are value for money as they come in big portions and at reasonable prices?. The lunch set allows diners to spoil themselves with a selection of soup or salad to go with their main course at only RM29 or any main course with dessert for RM29. If you are a big eater, you can have starters, main and dessert for only RM39. Each main course comes with a choice of mango and lime juice, iced lemon tea, coke or sprite. The all-new lunch set is served everyday from 12pm to 5pm.